Jurnal Politik is the official journal published by the Department of Political Science, Faculty of Social and Political Sciences, University of Indonesia. It was previously known as Politea: Jurnal Ilmu Politik which was started in 2007 and then changed into Jurnal Studi Politik which was running between 2011 until 2013. This journal is re-published for the first time in August 2015. Jurnal Politik serves as a medium to disseminate scientific papers and various studies on contemporary politics. This journal aims to publish any kinds of popular scientific papers or research discussing either political phenomena or social political thought. Publishing articles in this journal is the part of contributing to the development of political science. Jurnal Politik is published twice a year: in February and August. The Editorial Board of Jurnal Politik invites experts, scholars, practitioners, students, and intellectuals to submit their writings. Editors will select every manuscript submitted to Jurnal Politik using the blind reviewer mechanism from peer reviewers asked by editors. Reviewers of this journal come from national and international universities and academic institutions. Jurnal Politik has obtained an accreditation from Ministry of Research, Technology, and Higher Education of the Republic of Indonesia by SK No. 21/E/KPT/2018 (for the period 2016-2020). We invite authors to submit manuscripts to be published by our journal. The article should follow our guidelines and be written in English or Indonesian. There are no publication fees. 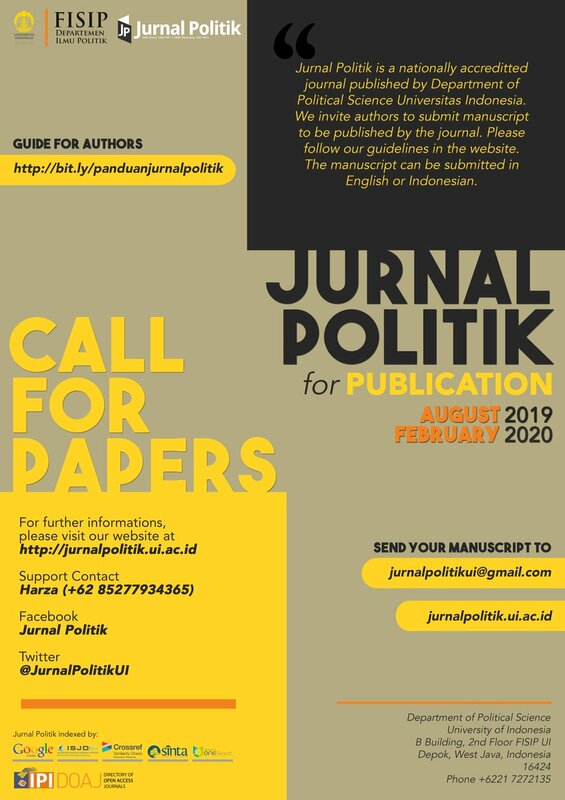 Jurnal Politik on Twitter: "Call for Papers: August 2019 and February 2020.… "